NEW! Multimedia demonstrations of Leeuwenhoek and his microscopy. microscope research, and this new resource is our way of saying 'thank you'. Antony van Leeuwenhoek (1632-1723) has often been designated as a dilettante. The voluminous writings he sent to London expounded his views on many subjects, social as well as scientific, and recorded detailed observations on a range of specimens. Most of the letters went to the Royal Society of London, who did not always treat him well. The collection of hand-made microscopes he bequeathed them were taken in the early 19th century, and attempts to determine their fate were hampered by official indifference. In 1981, during the Presidency of Sir Andrew Huxley, nine packets of specimens were found by the author amongst Leeuwenhoeks papers at the Royal Society. It transpired that the presence of several of these packets had been noted by one or two earlier workers, but their existence had since been overlooked. Examination of the surviving material by both optical and electron microscopy has revealed how he prepared his material, and confirmed what an excellent technician Leeuwenhoek became. This bibliography lists over 140 publications on this topic. Leeuwenhoek has been condemned for failing to link microorganisms to transmissible diseases. It is argued that, in his appreciation of the wonder of microbes in the firmament of living organisms, Leeuwenhoek was closer to a true appreciation of their role in the conduct of a global ecology than much contemporary science. BJF, 1981, The van Leeuwenhoek Specimens, Notes & Records of the Royal Society, 36 (1): 37-59. BJF, 1981, Leeuwenhoeks Specimens discovered after 307 years, Nature, 292: 407, 30 July. 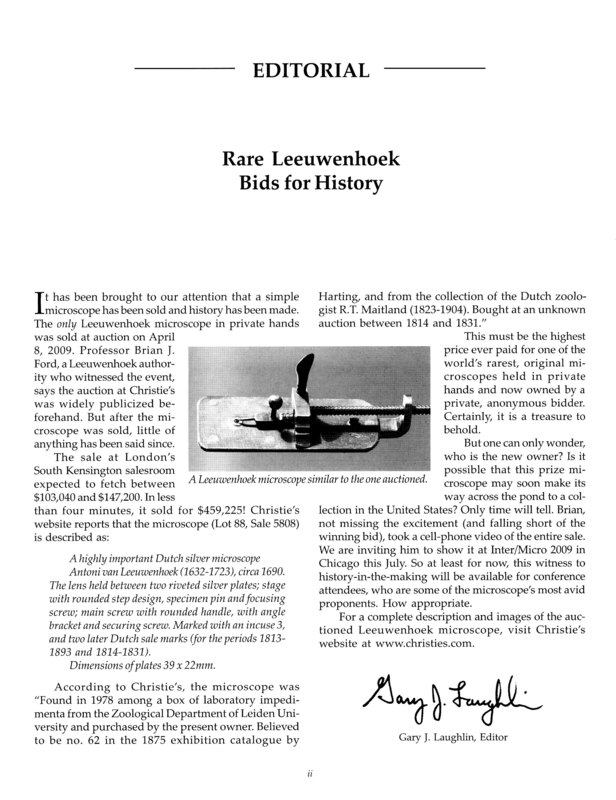 BJF, 1981, Found - van Leeuwenhoeks Original Specimens, New Scientist, 91: 301, 30 July. 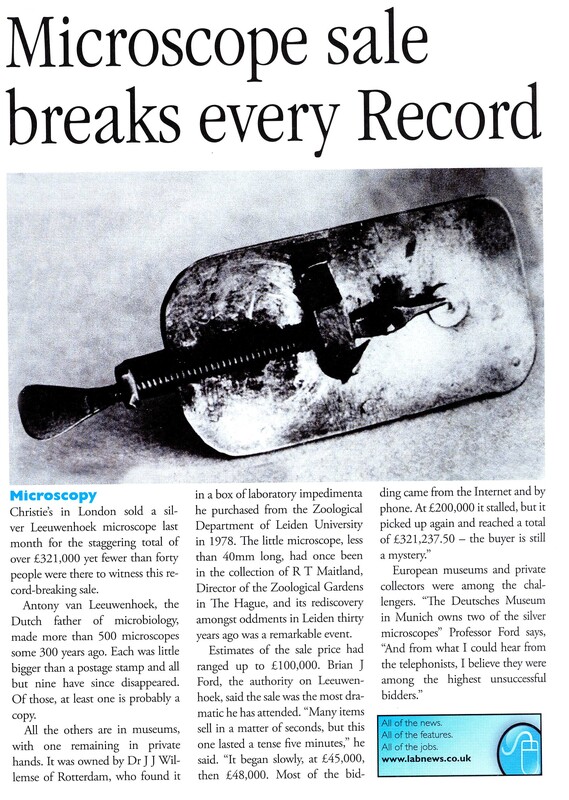 Report, 1981, Microbiology - Historic Find, Doncaster: Evening News,, 30 July. Report, 1981, Science Shock, Birmingham: Evening Mail, 30 July. Report, 1981, New Find shatters Scientists Beliefs, South Wales Echo, 30 July. Walgate, Robert, 1981, Schnitte aus dem 17. Jahrhundert, Zeit-Online, 17 August. BJF, 1981, The Leeuwenhoek Specimens. 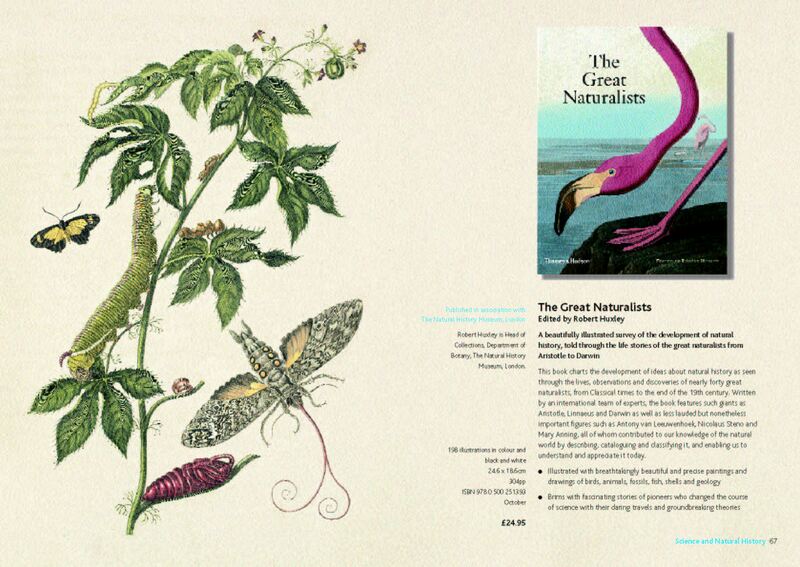 [Presentation and exhibit for Quekett Microscopical Club], Natural History Museum, 25 August. [reported in: Quekett Microscopical Club Newsletter, 21: 1a, March 1982]. Award, 1981, BJFs correlated electron and optical micrographs of sections cut by Antony van Leeuwenhoek [highly commended], Royal Microscopical Society Competition, 15 September. Cairns, John, 1981, Report on Leeuwenhoek specimens, Aquatic Biology , Louisiana, November. BJF, 1981, Ce quobservaient les Premiers Microscopistes, La Recherche, 12: 1147-1149. BJF, 1981, The Annotation of Leeuwenhoeks packets of Specimens - a Preliminary Account, Proceedings of the Royal Microscopical Society, 16 (6): 393-395. BJF, 1982, Bacteria and Cells of human Origin on van Leeuwenhoeks Sections of 1674, [leading paper], Transactions of the American Microscopical Society, 101 (1): 1-9. Degeunt, Philippe, 1982, [Television interview], Leeuwenhoeks Researches, Élémentaire, mon cher Einstein, French Television, 15 March. Award, 1982, View of Leeuwenhoeks Specimens through the Microscope at Utrecht, [prizewinner in] Annual International Photographic Exhibition, Institute of Science Technology, April. BJF, 1982, Cytological examination of Leeuwenhoeks first Microbial Specimens, [invited contribution and lead paper], Tissue and Cell, 14 (2): 207-217. Report, 1982, A Vision Rediscovered, Science Now magazine, 2 (20): 556-559. Poster, 1982, The Worlds Oldest Microscope Specimens - A Special Lecture by BJF, London: Natural History Museum, July. Announcement, 1982, The Worlds Oldest Microscope Specimens, Todays Events, The Times, 25 September. BJF, 1982, Worlds Oldest Microscope Specimens [lecture for the public], Natural History Museum, 1500h, 25 September. BJF, 1982, The Origins of Plant Anatomy - Leeuwenhoeks Cork Sections Examined [invited contribution], International Association of Wood Anatomists Bulletin, ns 3 (1): 7-10. BJF, 1982, Revelation and the Single Lens, British Medical Journal, 285: 1822-1824, (reprinted as pp 1-7), December. BJF, 1982, Antony van Leeuwenhoeks Sections of Bovine Optical Nerve, The Microscope, 30: 171-181. BJF, 1982, Leeuwenhoeks Original Specimens Examined after 307 Years [revised version of paper in Nature], Photographic Review, Olympus, 3 (1): 10-12. Palm, L. C., and Snelders, H., 1982, [cite Brian J Fords Leeuwenhoek research in], Antoni van Leeuwenhoek: 80, 187 et seq., Amsterdam. BJF, 1984, Leeuwenhoek Bibliography, Proceedings of the Royal Microscopical Society, 19, (1): 3, January. BJF, 1984, Bacteria and Cells of Human Origin on van Leeuwenhoeks Sections of 1674 [adapted from: Transactions of the American Microscopical Society, q.v.,] Lead Article, Bioscience, 34 (2): 106. Report, 1984, BJFs fascinating submission to RMS Photomicrograph Exhibition, Proceedings of the Royal Microscopical Society, 19, (4): 184. BJF, 1984, Una Ojeada Electronica a los Animalculos de Leeuwenhoek, Rassengna, [Central American Medical Journal], 2: 12-15. Mann, R. D., 1984, [cites BJF in] Modern Drug Use, an Enquiry based on Historical Principles: viii, 250-251, Lancaster and Boston: MTP Press, November. Report, 1985, Speuren met oude spullen van Antoni van Leeuwenhoek, Logboek van de Wetenschap, Eindhovens Dagblad: 11, 12 April. Award, 1985, Technical Photomicrographs, International Photographic Competition, London: Institute of Science Technology, Autumn. BJF, 1985, [paper] Origins of Microscopy, Cambridge Medical Society, Newmarket, 15 November. Frank, Arthur, 1985, Lost or Forgotten Microscopes [cites the recent discovery by Brian J Ford], Microscopy, 35: 270-271. Announcement, 1986, BJF and The First Specimens for the Microscope Conversazione Presentation, The Linnean: 3, 30 April. Darnell, James; Loadish, Harvey; & Baltimore, David, 1986, describe Brian J Fords Leeuwenhoek research (plus two illustrations) in Molecular Cell Biology: 3, 1187, New York: Scientific American Books, August. BJF, 1986, The Leeuwenhoekiana of Clifford Dobell, Notes & Records of the Royal Society 41 (1): 95-105, November. Nuttall, R. N., 1987, [cites BJF Leeuwenmhoek research in] Development of the Microscope 1800-1851, Microscopy 35: 591-604. Russell, N., 1989, Report of BJFs lecture, Antony van Leeuwenhoek as an Experimental Biologist, Biology History, 2 (2): 12. BJF, 1988, Lecture at Inter-Micro 88: i) An Evening with Brian J Ford - The Natural History of the Lens, Chicago: 27 June. .McCrone W., 1988, [reports] BJF paper to Inter-Micro 88, Life History of the Lens, The Microscope, 36 (4): 232. Palm, L. C., 1989, [Cites Brian J Ford in] Notes and Records of the Royal Society, 43: 198, 207, August. Hall, A. R., 1989, [Cites Brian J Ford in] Antony van Leeuwenhoek, ibid., 43: 248-273, August. BJF, 1989, The Discovery of Saccharomyces, Ferment, 2 (4): 221-223, August. BJF, 1989, [proofs] Antony van Leeuwenhoek, Microscopist and Scientist, Institute of Biology, September. BJF, 1989, Reappraising the Origins of Microscopy [with colour illustrations], Leading Paper, Microscopy and Analysis, 13: 7-10. BJF, 1989, The Early History of the Optical Microscope [lecture], Appalachian Microscopical Society Meeting at Charleston, South Carolina, 20 October. BJF, 1989, Leeuwenhoeks Techniques of Microscopy [lecture], Clemson University, South Carolina, 21 October. BJF, 1989, A New History of the Microscope [lecture demonstration], Linnean Society, Burlington House, 2 November. Highfield, R., 1989, 1600 Microscope as Good as Modern One [with picture], Daily Telegraph: 7, 3 November. BJF, 1992, La Naissance de la Microscopie [lead article], Paris: La Recherche , 23 (249): 1370-1378, Decembre. BJF, 1996, Hidden Secrets of the Royal Society Archive [illustrated lecture], Systemics and Museum Collections, Linnean Society Regional Meeting, Belfast: Ulster Museum, 1430h, 28 August. BJF, 1997. The Birth of Crystallography and the Dawn of Duplicity, Lecture at Birkbeck College, London University, 1300h, 12 May. BJF, 1997. Earliest days of the Optical Microscope, Lecture at Padova University, 1530h, 2 June. BJF, 1997. Anton, Antony or Antoni? What was Leeuwenhoeks name? Lecture at Inter Micro 97: 0930h, 23 July, Chicago: McCrone Research Institute. BJF, 1997. Analysis of Leeuwenhoeks specimens for the microscope, Microscopical Society of Southern California lecture, Los Angeles, 1900h, 28 October. BJF, 1997. Antony van Leeuwenhoek and the Single Lens Microscope, San Francisco Microscopical Society and California Association of Criminalists lecture, Berkeley, 2000h, 30 October. BJF, 1998, Recreating the Birth of Modern Science, (lecture to Kelvin Club), Cambridge: Peterhouse, 17 November, 1900h. BJF, 1999. Leeuwenhoek images [in] Exhibition on Microscopy, Corning Museum of Glass, New York: Corning, in preparation. BJF, 1999, Stepping back in time - how the first microscopists viewed their specimens, presentation to Cambridge University Philosophical Society, 1 February, 2000h. BJF, 2000, The earliest days of the microscope [chapter in] Yearbook of Science and the Future 2000, ISBN 0-85229-702-5, Chicago: Encyclopaedia Britannica, pp 192-209. BJF, 2000, interviewed on Leeuwenhoek and bacteria, High Resolution, BBC Scotland, 28 January. BJF, 2000, Recreating the Origins of Modern Biology, 120th Anniversary and Millennium Lecture, Manchester Microscopical Society, University of Manchester Medical School. 1900-2100h, 17 February. BJF, 2000, Eighteenth Century Scientific Publishing, [chapter in] Thornton and Tully's Scientific Books, Libraries and Collectors, ed. Andrew Hunter: 216-257, London: Quaritch, March. BJF, 2000, Hidden secrets in the Royal Society library, illustrated lecture to Friends of the University Library, Cambridge, 13 May, 1100-1200h. BJF, 2000, The Amateurs who Give us Science (seminar), London: Institute of Cultural Research, 1430-1630h, 27 May. BJF, 2000, Home-made microscopes (video presentation) Inter Micro 2000, Chicago: McCrone Research Institute, 27 June 1230-1250h. Anon, 2000, Noted British microscopist, Microscopy Today, 00 (5): 5. Anon, 2000, BJF receiving August Kohler award, News of Members, Biobits: 6, July. Report, 2000, British win US microscopy award again (with colour picture), Laboratory News, Microscopy and Imaging: 3, August. Report, 2000, August Kohler Award (with colour picture), Microscopy and Analysis: 55, September. Applebaum, Wilbur (ed), 2000, cites BJF's Leeuwenhoek Legacy in Encyclopaedia of the Scientific Revolution: 357-8, New York: Garland. BJF, 2000, Tracing the Roots of Modern Bioscience, illustrated lecture, Georgia Microscopical Society, Atlanta: Fernbank Science Center, 1900-2000h, 27 September. BJF, 2000, Revelations of the First Microscopes, illustrated lecture, New York Microscopical Society, New York: American Museum of Natural History, 1900-2000h, 28 September. BJF, 2000, The microscope and the birth of bioscience, Cavendish Laboratory seminar, University of Cambridge, 1430-1530h, 27 October. McCrone, 2000, reports Brian J Ford at Inter Micro, The Microscope, 48 (3): 135, 138, 145. Parnes, O, 2000, cites Single Lens, 1985 [in] Science in Context, 13: 71. Ratcliff, M., 2000, cites BJF in Microscopy, 1982 and Single Lens, 1985 [in] Science in Context, 13: 93. Ford, Brian J., 2001, The Royal Society and the Microscope, Notes and Records of the Royal Society, 55 (1): 1-25, January. Report, 2001, A Grand Occasion (with photograph) Biobits: 1, January. Corliss, John O, 2002, citations of Brian J Ford Single Lens and Leeuwenhoek Legacy [in] A Salute to Antony van Leeuwenhoek of Delft, Protist, 153: 177-190, June. BJF, 2002, interviewed on Leeuwenhoek by Adam Hart-Davis [in] New Worldes, What the Stuarts Did for Us, BBC 2, 20-30-2100h, 11 November. Bishop, L M, 2003, includes Leeuwenhoek cork section imaged by Brian J Ford through a scanning electron microscope [in] How to win the Nobel Prize, notes from an Unexpected Life in Science, Harvard: University Press. Coppedge, David, 2003, includes image of Leeuwenhoek microscope [in] Microscopic Magnificence, Christian History, 76, vol XXI (4): 42-43. BJF, 2003, interviewed on Leeuwenhoek by Adam Hart-Davis [in] New Worldes, What the Stuarts Did for Us (repeat), BBC 2, 2030-2100h, 26 June. BJF, 2003, interviewed on Leeuwenhoek, Inventors Imperfect, BBC Radio 4, 1100-1130h, 29 October. [Sound file in archive]. Rudzik, Eileen Pyne, 2003 (ed) includes microscope images by Brian J Ford [in] Flow of Matter in Living Systems, Pearson Education Canada. Paustian, Timothy, 2004, publishes BJF Leeuwenhoek micrographs in microbiology text for Atomic Dog (www.atomicdog.com). Vellinga, Willem-Pier, 2004, published BJF Leeuwenhoek micrographs in microscopy coursebook, Eindhoven University of Technology. 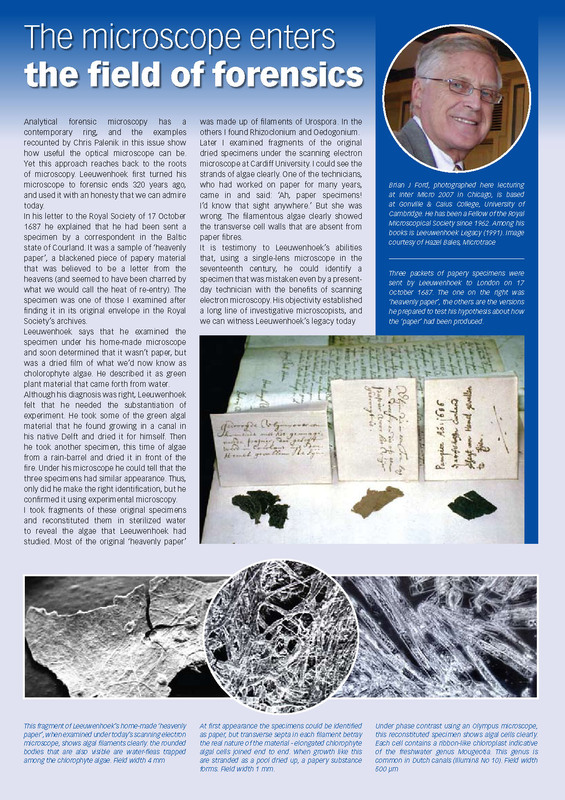 Bishop, L M, 2004, includes Leeuwenhoek cork section imaged by Brian J Ford through a scanning electron microscope [in] How to win the Nobel Prize, notes from an Unexpected Life in Science, Harvard: University Press. Lecture at Inter Micro 2007, Chicago: BJF, 2007, Production and use of a bead-lens Microscope, workshop at McCrone Research Institute, 12 July. cCrone Research Institute, Chicago, Illinois. Wheelis, M., 2008, publishes Brian J Ford micrograph of human blood under Leeuwenhoek microscope [in] Microbiology, Jones and Bartlett Publishers. Jeffrey and Ross, 2008, include comparison of cells viewed through 2 different types of microscope (from example: Leeuwenhoek & moder Leitz microscope images of same cells) Source: http://www.brianjford.com/wav4pix.htm [in] N.S.W. Biology, Australia/New Zealand: Macmillan, A$69.95. BJF, 2008, The First Microscope Detective: Retracing the origins of forensic microscopy, Keynote address to California Association of Criminalists, San Diego: 0900-0945h, 7 May. BJF, 2008, Leeuwenhoek and the Birth of the Microscope, Opening Lecture to Medical Sciences Historical Society summer conference, London: Institute of Biomedical Science, 31 May: 1400-1500h. Christensen, S. M., Kunding, A. H., and Stamou, D., 2008, include Brian J Ford studies of Leeuwenhoek microscope and erythrocytes, Det nye biokemiske laboratorium, Akyuel Naturvidenskab:21, September. BJF, 2009, presentation for Inter Micro 09: A Unique Leeuwenhoek Microscope Sale in London, 1630-1700h, Monday, July 6, Crone Research Instute, Chicago.